Howard County has a rich history in farming. Listed below are many of the farms in Howard County and the services that they offer. To narrow your search, choose a category from the drop down menu, then click update and click on farm name for more details. Love Dove Farm offers naturally grown vegetables for sale at several farmers markets and through its CSA. In 2010, John Dove, a fourth generation farmer, began to diversify his family’s farm from just growing conventional crops like hay and adding naturally grown salad greens and vegetables. Breed horses and ponies, sales, and boarding for retired horses. Maple Lawn offers fresh free-range turkeys for November and December, and fresh frozen turkeys for the rest of the year. You can buy the turkeys on the farm or at local grocery stores around Maple Lawn. The Iager family has owned land in Fulton since 1839, where they raise Holstein dairy cattle and since 1938 their “Sho-Nuf” brand turkeys for the holidays. The large modern barns allow the turkeys to roam freely inside and out. 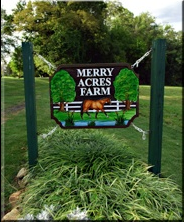 Originally a dairy farm from 1957 to 1998, the owners of Merry Acres began boarding horses in 1997, and opened an arena barn in 2005. They make their own hay and crop some of the other acreage. Established in 1998, the farm offers riding lessons, boarding, training, and shows. Catering and special events – weddings, company picnics, family reunions. Solar farming. Hay and straw. Don't put all of your eggs in one basket. Diversifying your farm's production is a great way to grow your business - and meet increasing consumer demand for fresh foods. Howard County offers farmers markets five days a week throughout the county. Farm fresh produce is much closer then you think.